Okay, guys, we get it. You think we’re idiots because we can’t drive in the snow. But let’s try a little empathy, shall we? Let’s look at why we can’t drive in the snow. It’s not snow; it’s ice. First, let’s draw a distinction here: nice, crunchy snow is actually pretty easy to drive on. Ice, however, is not. And that’s what we have here. With temperatures usually in the upper teens and 20s, what happens is that every time a tire drives over the snow, it melts just a little and then re-freezes almost immediately as ice. Ice is slippery, y’all. No one–regardless of where you’ve driven previously–can drive well on ice. Even a Zamboni can’t make it uphill. Welcome to life in the south. For ten months of the year, the weather is anywhere between mild and oppressively hot. So, with limited budgets, the state and cities don’t exactly prioritize the rare need for snowplows and brine trucks (average annual snowfall is just 6 inches). Up until the last few years, there were plenty of winters when Nashville never got a single event of sleddable snow. So, not only do we not have the equipment to deal with much more than a dusting of snow, we don’t have much experience cleaning it up, either. No equipment. Not only do our governments not prioritize snow gear; we don’t either. Tennesseans (particularly in west and middle Tennessee) generally do not bother to buy snow tires, chains, or other gear or special equipment/options on our cars. No, we have front-wheel drive cars with “all-season” tires that are useless in wet and icy conditions at or below freezing temperatures. A recent article from Outside magazine explains why this is a problem. Volume. The population of the mid-state area has increased by more than 150,000 people just since 2010. Those of us who have been here longer than that still haven’t gotten used to it. All these people apparently have cars, too, because damn, there’s a lot more traffic than there used to be. More traffic, more problems. Denial. Our weather is erratic. Any time there’s snow, many of us assume the roads are fine. Because it was 70 degrees last week! Arrogance. Real talk: many a good southerner has a four-wheel drive or all-wheel drive vehicle that’s great for off-road travel. So we assume that we’re invincible in snow and ice, too. Sometimes, we get lucky. Many times, we do not. Our vehicles still don’t have the right tires (usually) for driving on ice, so we don’t even know we’re not prepared until it’s too late. Ignorance. More real talk: some people actually don’t bother to look at weather or traffic reports before they leave the house in the morning, so they are not prepared for what may have changed since they last looked. These people are the first to get in wrecks, backing up streets and interstates for hours. Or, in the case of the January 6 snow, they were on the roads at 6 a.m. and everything was “fine.” These people are typically known as “bosses.” If they can get to work, you can, too. And when you can’t, you’re an “idiot” who “can’t drive in the snow.” These people are not native southerners. Photo by Collyn Wainwright. 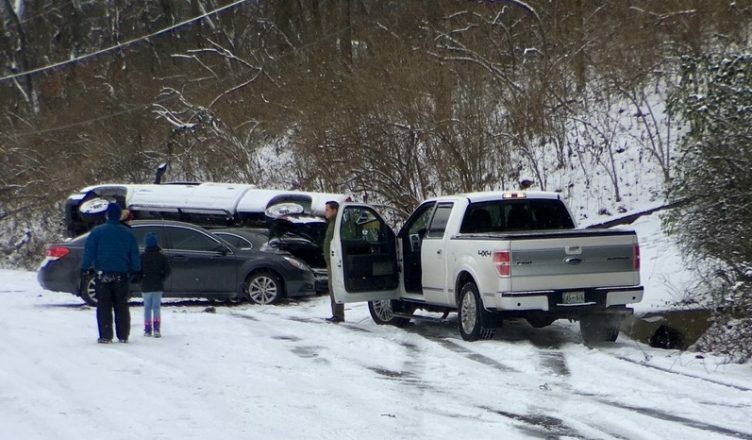 This hill near Radnor Lake claimed more than ten vehicles, including a salt truck and an ambulance.